Campaign for the American Reader: Salman Rushdie's "6 March 1989"
On March 6, 1989, Ayatollah Khomeini, the spiritual leader of Iran, issued a fatwa against Salman Rushdie over the "blasphemous" content of his novel, The Satanic Verses. Rushdie issued a poetic response i n the Fall 1989 issue of Granta. Click here to read the (brief) poem. Did he think at the time he wrote the poem that it would take nine years before the Iranian government lifted the fatwa? Unlikely, I think. Last year he sat for an interview with Emma Brockes of the Guardian and discussed, among other things, the hangover from living nearly a decade with a death sentence looming over his head. I [Brockes] tell him that I imagine his hate gland was so stimulated by the experience that it might have been hard to stop hating when it was all over, and he says, "it was the other way, actually. I had a kind of education in hate, because of being the object of it. But I also had an education in the opposite, because what happened in those years was that an enormous number of people really grouped around me to help me get through it. It was extraordinary to be the recipient of that very courageous affection. And what I took away from those years was the affection more than the hostility. I understood that the hostility was capable of damaging me a lot. I didn't want to become some embittered old hack getting his revenge for the rest of my life. And I didn't want to become some scared creature cowering in a corner. I remember telling myself not to carry the hatred around, although I know where it is. I have it in a trunk in storage." 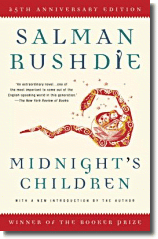 The Satanic Verses caused the greater political stir but most readers consider Midnight's Children to be Rushdie's best book.